The fifth movie of the Naruto Anime series was released in theaters in Japan on August 2, 2008. It was directed by Hajime Kamegaki and written by Junki Takegami. The theme song for the movie is "No Rain No Rainbow" by Home Made Kazoku. The film has gone on to be highest grossing of all the Naruto movies. A mysterious group of ninja called the Sora-nin from the Sky Country makes a surprise attack on Konoha. This is because Konoha nearly destroyed the Sky Country during the last Shinobi World War. However, they survived and now are after Konoha and the Fire Country for revenge. The group starts attacking Konoha causing mass mayhem, with flying ninjas on winged-mechanical devices bombarding the village. A boy comes all the way to inform Konoha that his village had been attacked and he was looking for his sensei, who was currently in Konoha, to go with him to heal the injured at his village. A 3 man team consisting of Naruto, Sakura and Hinata are sent along to help the boy's village and they accompany Amaru, the boy and Shinnou his sensei back to the village. The team travel through a forest full of eerie beasts and poisonous animals by small rowing boats down a river. A Sora-Nin suddenly appears and they hide by the riverside with Naruto and Amaru hiding underwater until the Sora-Nin goes. When they resurface, Amaru gets caught in the weeds underwater and loses his precious scalpel (a present from his beloved sensei). While helping Amaru with the weeds, Naruto notices that Amaru is in fact a "she" due to her breasts present. Naruto blushes while at the same time, a poisonous piranha-like fish bites him and he faints. Later on, Naruto wakes up still blushing, also because Amaru was sucking the poisonous blood out of the wound on his thigh thus saving Naruto. Naruto asks her if he's a "she" and suggests that Amaru has feelings for her sensei and he gets slapped. Meanwhile at Konoha, the Sora-nin retreats because they were out of chakra to maintain flying, so Konoha sends another special team to look for their base. Sai approaches the ships which is near the beach on one of his ink birds to attract attention while Shikamaru and Kakashi hides behind some rocks near the shore waiting for the right time to infiltrate and attack. At Orochimaru's lair, Orochimaru is now ill because the body transfer jutsu he uses is close to expiration. Kabuto is attending to him and tells Sasuke that the Sora-nin is attacking Konoha to which Sasuke gives an "I don't care" reply. Orochimaru orders Sasuke to get a man who is able to help him perfect his reincarnation jutsu. Naruto and company finally reach Amaru's village to find that the village had been badly attacked and some parts are now in ruins with the inhabitants nowhere to be seen. Amaru cries and runs around trying to find some villages she unknowingly triggered a trap with a bunch of kunai flying towards her, her sensei Shinnou steps in and protects her but fails. Naruto, Sakura and Hinata run to the scene but it was too late, Shinnou dies. After Amaru comes to her senses they continue to look for villages. Sasuke is on his way to the village. Later on through a series of events Hinata gets separated from Sakura and Naruto. Naruto and Sakura find themselves in front of a evil monster that feeds on the darkness of human souls and somehow took over Amaru. Sakura proves to be no match for the beast, the creature senses that Naruto has a huge dark energy/power inside of him so it taunts Naruto and tries to make him use that power, saying "He cannot save anyone without it" this makes Naruto remember about his failure in saving Sasuke and is emotionally unstable taking on the Nine-Tailed Demon Fox form, eventually the four tails state. After fighting for a while, he turns back to normal when Sakura regains consciousness and gives Naruto the seal which Jiraiya gave to her earlier. Naruto tells Amaru to ignore the darkness in her heart which finally resulted in the beast getting defeated. Sakura wakes up in Naruto's arms and punches him - awkwardly. They decided to separate with Naruto going on to look for the villagers and Hinata and Sakura going back to get help. Amaru, who was supposed to go with Sakura stays to help Naruto. They then found some old ruins in which Shinnou mentioned earlier and enters the ruins. Shinnou is inside - safe and sound saying something about conquering the world with the power of darkness. Amaru, excited that her sensei is alive runs to hug him, Naruto notices something's not right and Shinnou laughs at Amaru for trusting him. Shinnou tells that he's been researching on the power of darkness for about 15 years and he's finally found it in Konoha now he only needs secret scroll with a reincarnation jutsu or something written on it. He then transforms into a huge hulk-like creature. Naruto charges towards him only to be outmatched again and again, beating Naruto badly. Shinnou in the hulk-like form also tries to convince Naruto to use the Nine-Tailed Demon Fox's chakra. Amaru cries while Shinnou and Naruto duke it out. When she was small, she suffered from a strange illness. No one liked her, fearing that they'll be infected. Only Shinnou cared for her and managed to cure her. Naruto tells her not to throw her feelings away while the evil Shinnou mocks her. She finally admits her love and feelings to Shinnou, causing him to hesitate and allowing Naruto to land a hit. Sasuke appears suddenly saying "Orochimaru needs help with a reincarnation jutsu" to Shinnou and Shinnou gives him a scroll. Sasuke attacks with Chidori Senbon which attacks Shinnou's cells and he turns back to normal, who then flees the scene and Sasuke after him. Naruto tells Amaru to go find the villagers while he goes after Sasuke. He finds Sasuke in a room and asks him "What are you doing here?". In the same room is a cocoon which is absorbing dark chakra, Shinnou fuses with the cocoon and attacks Naruto and Sasuke. With tentacle arms Shinnou tries to absorb their chakra, Sasuke turns to Curse Seal level 1 and releases evil chakra and Naruto who got Sasuke's plan turns to his Nine-Tailed Demon Fox form sending a lot of chakra. After breaking free, Sasuke ascends to Curse Seal Level 2. The creature now acts on its own after absorbing Shinnou. In the meantime, Konoha successfully infiltrates the Sora-nin's base. Amaru finds Hinata and the villagers in a cell and frees them all and going off in lifeboats. Naruto appears again and orders Amaru to go, she refuses and Sasuke throws her in by force. Naruto also forces Sasuke onto the lifeboat with Rasengan (Naruto whispers something to Sasuke) who then escapes. Remembering Jiraiya once said that Naruto had the willpower to never give up, he creates some shadow clones and start to destroy the ruins. When all was destroyed, he collapsed. Amaru, from a distance, sees Naruto and grabs a pair of Sora-nin wings and goes towards him. Upon reaching him, she grabs him and they fall together. Jiraiya suddenly pops out with Gamabunta and catches the two, thus saving them. Later on, Naruto wakes up in Amaru's arms. Sakura and Hinata are jealous. Sasuke goes back and gives Orochimaru the scroll, who then asks if something good had happened. 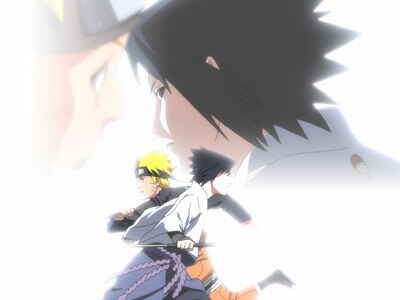 Sasuke then goes off to train and remembers Naruto's whisper- "I'll definitely bring you back to Konoha, Sasuke!"